Background and Objectives: Inflammatory Bowel Disease (IBD) is a group of inflammatory conditions of the colon and small intestine. Crohn's disease and ulcerative colitis are the principal types of inflammatory bowel disease. IBD is a complex disease which arises as a result of the interaction of environmental and genetic factors leading to immunological responses and inflammation in the intestine. Curcumin, a yellow coloring agent is used as a remedy for the treatment and prevention of inflammatory disease. Curcumin is safe, non-toxic, and mediates its anti-inflammatory effects through the down-regulation of inflammatory transcription factors, cytokines, redox status, protein kinases, and enzymes that all promote inflammation. Methods: An attempt was made to formulate sustained release pellets of curcumin using Carboxymethyl Tamarind Seed Polysaccharide (CMTSP). Solid dispersion of curcumin prepared using soluplus and incorporated into pellets for enhanced solubility and bioavailability. A central composite design was applied to study the effect of independent variables (amount of microcrystalline cellulose MCC and CMTSP) on crushing strength and drug release of pellets. In vivo study of solid dispersion loaded pellets revealed the presence of more amount of drug in plasma than pure drug loaded pellets. Result: Dissolution and absorption of curcumin were found to be increased by 1.5 and 2 fold, respectively. 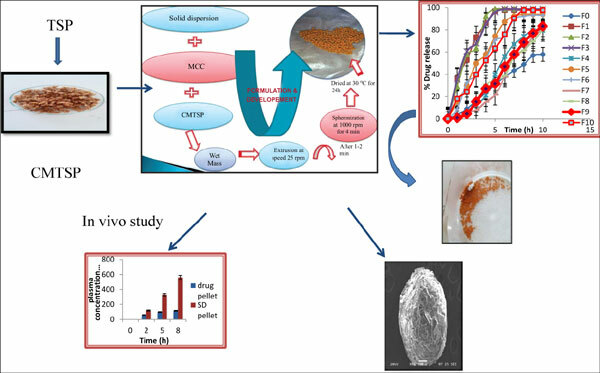 Conclusion: Carboxymethyl tamarind seed polysaccharide can be used successfully for colon targeted drug delivery system in the form of pellets. The percent permeability of pellets prepared by using solid dispersion was found to be more than pellets prepared by using pure drug. Curcumin has an advantageous safety profile as well as low relativecost, making it an attractive option for IBD patients. Keywords: Soluplus, carboxymethyl tamarind seed polysaccharide, extrusion-spheronization, solid dispersion pellets, inflammatory bowel disease, curcumin. Keywords:Soluplus, carboxymethyl tamarind seed polysaccharide, extrusion-spheronization, solid dispersion pellets, inflammatory bowel disease, curcumin. Abstract:Background and Objectives: Inflammatory Bowel Disease (IBD) is a group of inflammatory conditions of the colon and small intestine. Crohn's disease and ulcerative colitis are the principal types of inflammatory bowel disease. IBD is a complex disease which arises as a result of the interaction of environmental and genetic factors leading to immunological responses and inflammation in the intestine. Curcumin, a yellow coloring agent is used as a remedy for the treatment and prevention of inflammatory disease. Curcumin is safe, non-toxic, and mediates its anti-inflammatory effects through the down-regulation of inflammatory transcription factors, cytokines, redox status, protein kinases, and enzymes that all promote inflammation.